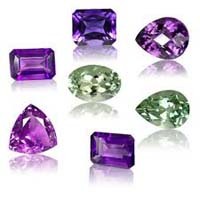 The amethyst crystal is one of the two february birthstones with the other one being bloodstone. The amethyst is also the zodiac birthstone for pisces and secondary birthstone of geminis. The amethyst gemstone is also the designated gemstone for the 4th and 6th wedding anniversary. The february birthstone amethyst means wisdom, spirituality, sobriety and security. The color of an amethyst is as unique as it is seductive, though in fact this gemstone of all gemstones is said to protect its wearer against seduction. The deep purple color of amethysts, associated with february birthstones, was considered rare and royal, and the kings and queens of Europe often had amethysts embellishing their clothing, and wore beautiful amethyst jewelry. The ancient Greeks believed that this gemstone held many powers, among them protection against intoxication. It is also believed that amethysts bring on pleasant dreams because they allow you to "channel" positive universal energy. As a result many people place an amethyst under their pillow before going to sleep at night to enjoy "sweet dreams" throughout the night. Amethysts change colour depending on the lighting environment it is in. Generally amethyst colours range from a deep purple to a light violet and all the colours and combinations in between them. Basically the color of an amethyst is divided into three components. Amethysts are said to bring calmness and serenity to its wearer as well as enhance a person's learning ability. It is also said to aid in the stability of the physical and emotional state of mind. It helps to build up the immune system and treat the problems in the nervous and digestive system. Major sources of amethyst are in southern Brazil and in neighbouring Uruguay. The third major export country is Madagascar. However, this gemstone is spread all over the world. One of the alternative february birthstones is the bloodstone. Its a interesting gemstone found mainly in India, China, Australia and the US. 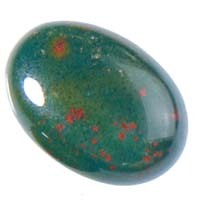 Bloodstone is a green semi-precious stone that has red spots. This stone could also come in various intensities of dark green with brown, red and other multicolored spots. This gemstone is said to increase the body's circulation of energy, balancing the base, navel, sacral, and heart chakras. This gemstone also helps its wearer with courage, good fortune and purification.